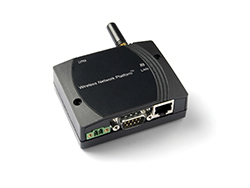 When configured as a Radio Frequency Web Enabler, the industrial Wireless Network Platform can be used to replace specific operator interfaces and provide flexible web based access to a device in combination with a PDA. As a Radio Frequency LAN Access Point, it acts as a highly reliable wireless access to Ethernet network used in demanding industrial applications. The Ethernet Cable Replacement may be used to connect a number of separate wired Ethernet networks using Radio Frequency technology. The Terminal Server provides Radio Frequency connections to multiple serial Radio Frequency devices with access to the devices from a PC on the TCP/IP network. The connection works like a virtual serial cable between the PC and the device. Finally, the product may be used as a Radio Frequency Serial Port Adapter.